This section is dedicated to explaining PowerShell’s individual syntactic elements. I also regard these topics as reference material for that time when you forget how to choose the correct type of bracket, or when a single quote does not get the job done. Curved () parenthesis stype brackets are used for compulsory arguments. Take for example a ForEach loop the first section is like Foreach ($Item in $Items). Microsoft call this 'control structure'. 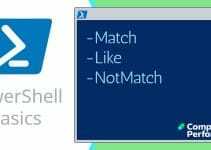 PowerShell has three main conditional operators, -Match, -Like and -Contains. Write-Host $WMI.count "WMI objects contain the word network"
Note 1: I make -Match my default when looking for an item, or wishing to filter a long list. At first glance, one of the strangest comparison operator in PowerShell is -eq. While the equals sign ‘=’ is still needed for declaring variables, in most other cases you need -eq, or for PowerShell not equal -ne. Once you warm to this theme, then -gt -lt seem a logical continuation. Consequently, abandon > and <, instead employ -gt (greater than) or -lt (less than). Each topic has its own ‘how to’ instructions and also ‘Learning points’. As a result you will be able to modify my examples to suit your situation. The only pre-requisite is that you must download the correct version of PowerShell and .Net Framework for your operating system. Microsoft’s site has separate versions of PowerShell for XP, Windows Server 2003 and Vista. In the case of Windows 7 and later, PowerShell is built-in but you need to ‘Add Feature’. The pages in this section will help you with PowerShell’s individual syntactic elements. I regard these topics as reference material for that time when you forget how to choose the correct type of bracket, or when a single quote does not get the job done. Another use of this page is to investigate new parameters or switches for well-known commands, for example -recurse as in: Get-Childitem -recurse.